Deep discounts on this towel - Click here! If you are looking for a super absorbent glass cleaning towel, the DI Microfiber Waffle Weave Glass Cleaning Towel is a great choice! This towel measures 16" x 24" and features thirst pockets that help lift, remove and trap liquids within the towel. 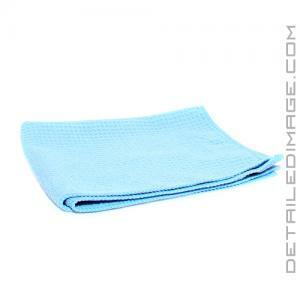 This towel will absorb up to 8 times its weight in liquid and can be used to safely dry smaller areas, clean windows and mirrors, and effectively use with any liquid detailing products. At 80% Polyester / 20% Polyamide 370 GSM, 100% split Chinese microfiber makeup this high-quality towel will last a long time. Grab a DI Microfiber Waffle Weave Glass Cleaning Towel today! Light Blue - 16" x 16"
These work GREAT! Perfect size and no streaking. A real pleasure to use. Good addition to MF towel arsenal at a reasonable cost. Does absorb a lot of liquid - works well with Invisible glass. Towels work great, however they started coming apart on the very first wash. The edge/stitching is separating from the towel. I tried your Great White MF towel, and it's easily the BEST MF towel I have ever used, and I've used a ton!! !